Coleslaw is a side dish that people ask for year round. Whenever we cook out burgers I hear someone ask if anyone made coleslaw. Depending on the recipe coleslaw can be surprisingly high in calories despite the fact that it has a lot of veggies. Finding good Weight Watchers recipes for common dishes is really important! 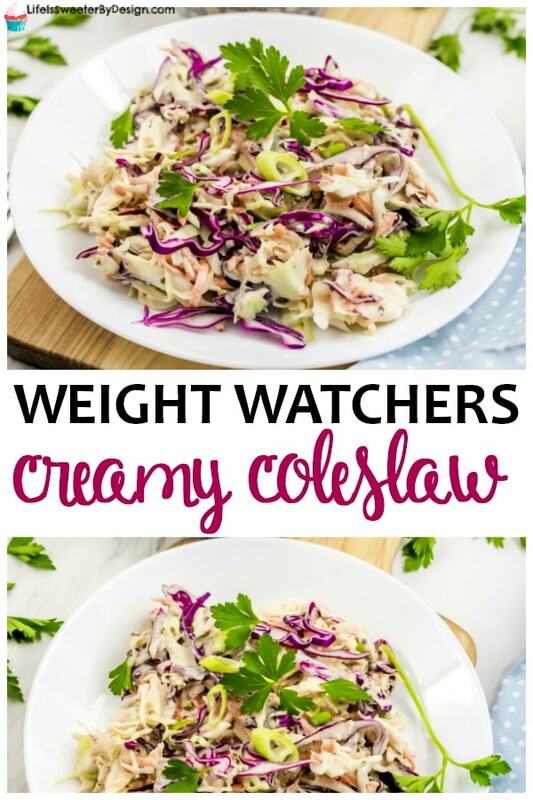 This Weight Watchers Coleslaw Recipe is creamy and delicious and no guilt! Finding the best Weight Watchers cookout recipes to keep on hand will make your life and your entertaining easier. I love the added veggies in this side dish too. Coleslaw is a favorite of my oldest daughter and she has become something of a conessour, LOL. If this passes her test then it is a winner for sure! It is possible to buy bags of pre-cut coleslaw at the store to save time, but you don't have to. 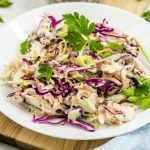 Especially if you are doubling or tripling this Weight Watchers Coleslaw Recipe then you may want to cut the veggies up yourself. Shred about half and head of green cabbage and half a head of red cabbage. This equals out to about 2 cups of green cabbage and 1 cup of red cabbage. Take a small bunch of radishes and shred up about 3/4 of a cup. Add all the veggies to a big bowl. 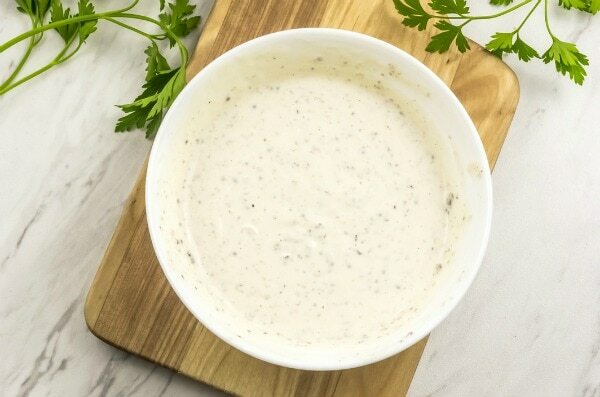 For the dressing you will combine all the dressing ingredients in a small bowl and stir well to combine. The best thing about this recipe is that it is only 1 Freestyle SmartPoint per serving! The only thing that has points is the dressing. The serving size is 1/2 cup! I was watching some game show recently and coleslaw was one of the top items people think of when they are planning a picnic . This sounded about right since many picnics and trips to the park involve a cookout. 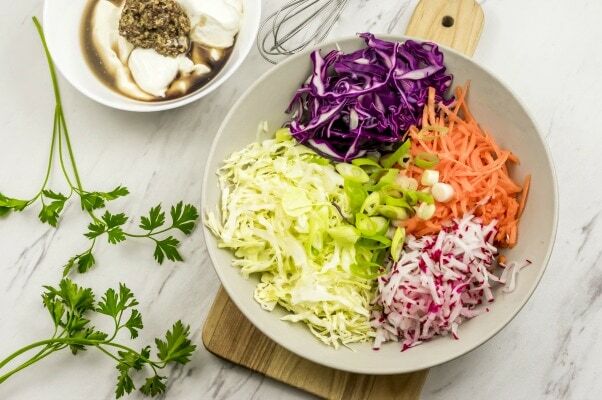 No one will even realize this Weight Watchers Coleslaw recipe is healthy! What do you like to take on your picnics? We love taking sliced fruit and triple berry fruit dip along for after lunch! 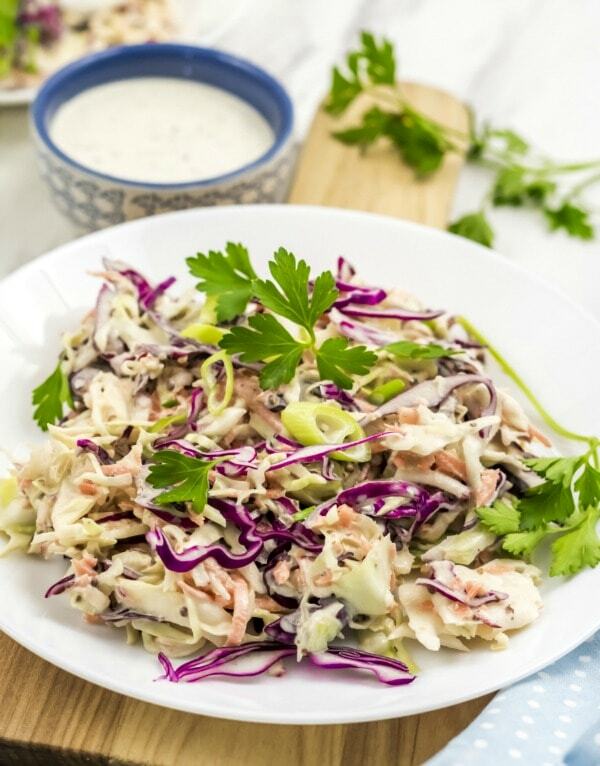 This Weight Watchers Coleslaw Recipe is creamy and delicious. It is the perfect Weight Watchers side dish or any picnic or cookout. Shred green cabbage, red cabbage, carrots and radishes and place in large bowl. Slice 3 scallions finely and add to bowl. Pour dressing over the coleslaw and stir well to coat. Weight Watchers Freestyle SmartPoints: 1 point per serving. Serving size is approximately 1/2 cup. The whole recipe has 6 points. There will be variation depending on what mayo you use. This was calculated using a light mayo that was 5 points per 1/4 cup. Obviously the amount of coleslaw will depend largely on the size of veggies you use! Love…love…love your blog! Such a great job you do!! Always find something of interest to me. Thank you so much Charlotte! You have no idea how much it means to me to know I am helping others! Hope your week is wonderful.